Safety Handicap Bathroom Accessories: Which Are the Most Important? Use this basic guide to help you select some of the most important safety handicap bathroom accessories for your disabled bathroom at home. Handicap grab bars can be placed anywhere there is a danger of slipping and falling. You can choose permanent safety railing or portable grab bars. Grab bars range in price from $10 to over $100, depending on what types you choose. They can be purchased in big box stores, shower and bath stores, as well as through online stores that specialize in handicap bathroom accessories. They can be placed inside bathtubs and handicap shower stalls, next to sinks and beside handicap toilets. Grab bars can be placed vertically, horizontally or at an angle. Permanent grab bars often require professional installation, unless you are an expert DYI'er. On the other hand, you can easily attach portable safety railings and remove them anytime you need them. These are also great for travel use as well. Larger grab bars such as 36" and 48" can be special ordered. You can also find portable telescoping grab bars that adjust to various lengths whenever you want. A small bar in a vertical position is often placed at the entrance of a shower or tub. While this facilitates entry, it also aids with the exit. Over 80% of shower and tub accidents occur on exit. Often, when needing help getting up, sitting down, after a slip or a fall or on entrance or exit into a disabled bath, an elderly or disabled person is either incapable of calling for help or can't be heard. An emergency call button and emergency pull cord ensures that the person needing help is able to summon aid immediately. These bathroom safety equipment are especially useful when dealing with elderly bathroom safety issues. Home emergency pull cords and emergency call buttons require no wiring. They operate on a wireless frequency and can be mounted anywhere. The receiver or base is portable and can be moved from one room to another. Emergency call buttons and pull cords generally cost around $300. A raised toilet seat can be the difference between using the toilet unassisted and using it with help. Inexpensive and easy to install, a raised toilet seat fits on the existing toilet seat. It snaps easily into place and allows the person using the toilet to sit without having to bend or excessively lower the knees. Raised toilet seats usually cost around $20 and can be purchased from big box retailers, on the Internet or in medical supply stores. Even a toilet bidet combo can be a good choice, especially for those who have less dexterity. 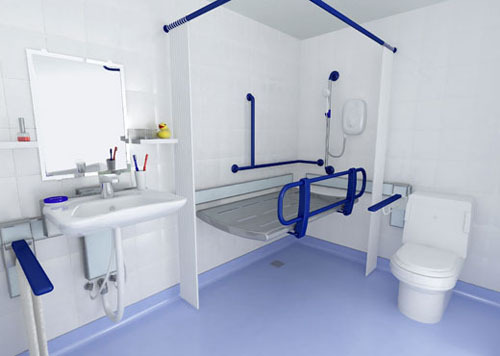 This toilet system can often make it possible for someone physically challeneged, to be able to use the bathroom unassisted. Toilet safety rails fit around the toilet area. They are attached to the wall or toilet. They enable the person using the toilet to balance as they raise up on and down off the toilet. Toilet safety rails generally run between $30-$70. Bathtub transfer benches are seats that swivel and then lower, enabling a person to be lowered, unassisted, into the water. Bathtub lifts and transfer benches can be height-adjusted and lock firmly into place, so there is no danger of falling. Bath transfer benches are an inexpensive alternative to walk-in bathtubs. The cost for bath transfer benches ranges from $34 to over $100. They are easily installed and do not require the assistance of a plumber. A bathtub lift or bench can be found at big box retailers, online and in medical equipment supply stores, as well as bath and shower shops. Take into consideration the age or disability of the person requiring various safety handicap bathroom accessories before deciding which bathroom safety products are right for your situation.